Sometimes you are forced into the rhythm whether you are ready for it or not. Friday Kathy and I had lunch with some friends at the local Chinese buffet. After lunch Kathy and I decided to check out Pope marsh for a Coot’s nest and wood ducks. We returned home about an hour and a half later and found a message on the answering machine. 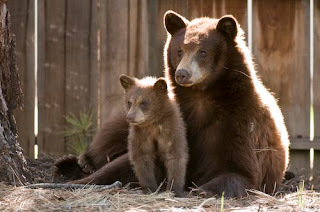 It was from our friends, they said that there was a black bear and her two cubs in their yard. I assumed the bears would have left by now as it was over an hour since they left the message (I was not in the rhythm). I went back to work in my office and about a half hour later got a call from Kathy saying our friends said the bear was still in their yard! Okay, this is crazy; bears don’t usually hang around that long. I grabbed my gear and headed to our friends house. I cautiously opened the back door, stepping out I kept one eye on mom while positioning my camera and tripod. She looked at me without concern as I made my first few images. This is too easy, I thought, as I pulled up a deck chair and made myself comfortable, lowering the tripod so I could shoot from the chair. 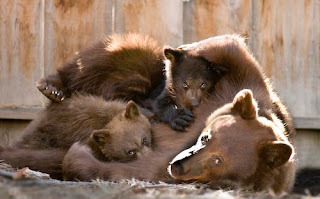 Every time she or the cubs moved into a different position I would press the shutter and make a few more images. Every now and then she would rise up, alert, looking toward the street. Click, Click. Then back down again. This peaceful session ended abruptly when two neighborhood dogs burst onto the scene barking ferociously. Before they were even in the yard the cubs were up a tree, mom took a little longer as she stood her ground to protect her cubs. When she knew her cubs were safe, and the lead dog was within a few feet, she jumped and in a split second was 15 feet up the tree! Luckily, the dogs did not stick around and momma came down from the tree within a couple of minutes. The cubs followed and in another couple of minutes I was fortunate to watch and photograph mom nursing her hungry cubs. A first, in Tahoe, for me. I spent 45 minutes photographing the bears. One of the longest sessions I have had with bears in Tahoe. I will post more photos, soon, on my web site under ‘Daily Log.’ Check ‘em out.